CPS operations staff at Toolik Field Station, Alaska, are finishing their spring projects and preparing to depart the research hub on the North Slope at week's end just ahead of the summer influx of research visitors. Every year, CPS staff complete maintenance and upgrade projects during spring and fall visits to the station, which is operated by the Institute of Arctic Biology at the University of Alaska under a cooperative agreement with the National Science Foundation. Among those projects this spring: weatherport maintenance. The list also included boardwalk installations for Gus Shaver and Gregg Starr. Starr's new NSF grant involves year-round field work at Toolik investigating physiological processes of tundra plants (respiration, growth, and photosynthesis) during the cold season. Recent studies indicate that these plants are active in the dark and cold, contrary to traditional thought. The Starr team wants to know to what extent cold season physiological processes differ from those during the 2-3 month growing season, information that should help scientists better understand the less-obvious but still important physiological processes ocurring during the fall-to-spring period. 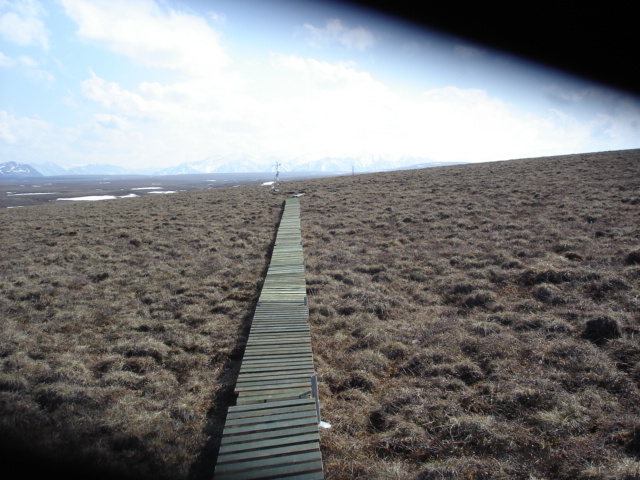 The team will establish growing plots that they will study over the next three years, and the boardwalk CPS has installed will keep the team from walking on and damaging the fragile tundra. Starr is due at Toolik for a 4-week field effort later this month.